Looking for a delicious cocktail to get you into the festive holiday mood? If so, you've got to try out this one! It's really easy-to-prepare and one you and your party guests will enjoy. Perfect for Christmas Eve toasts, Christmas parties and New Year's Eve. Pour over ice. 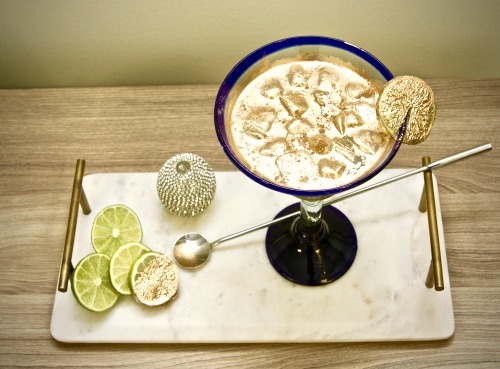 Topped off with 24K eatable gold powder that melts on top of the cocktail, giving a melted gold look floating on top of the Margarita. YUMMY! Allaire Privee's Tequila: The premium tequila is made with 100% select blue weber agave that were slowly cooked to give a perfect balance of sweetness. Made in small batches and crafted free of any additives to respect its true essence. Aged in bourbon casks and filtered with an innovative process to give it a smooth agave flavor and characteristic crystal tone. Although I know that eatable gold powder exists I am not sure that I would want to try it. However, this is a perfect cocktail for New Year's Eve.